This was the little convention treat made by my roommate and upline Shirley. Wasn't that a clever way to use the milk carton? The chocolates inside didn't make it home from Utah. It's been a week since my last post - yikes! And the funny thing is I have been stamping the whole time so I should have lots to share with you. I spent the last week stamping with 2nd and 3rd graders at College for Kids. It was a lot of fun, but just like my classes at school, they kept me on my toes. 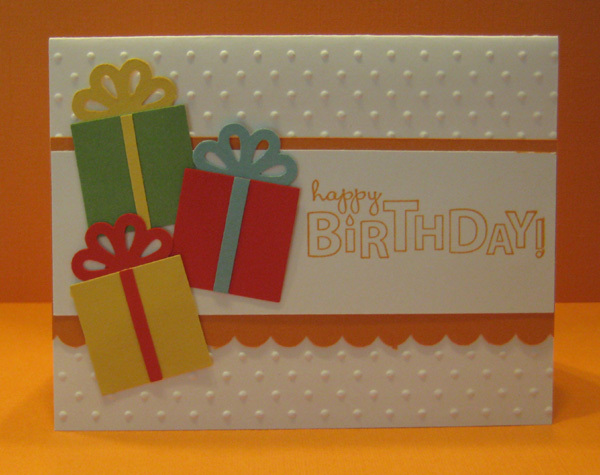 We created at least 2 cards every day (no small feat in an hour!) using techniques and tools I thought the kids would like. I even worked up the courage to use the shaving cream technique with them on the last day. I will post some pictures of our projects next week. I also had a Christmas in July Stamp-a-Stack so you can be watching for those cards too! In the meantime, here is another little treat for my convention roommates that matches their other gift. I decided to make one for myself because there was no reason I shouldn't be carrying cute gum around too! I just had someone tell me she wasn't sure about that new lace ribbon punch. Well thanks to a clever demonstrator (LeeAnn Greff, I think. Someone please correct me if I am wrong) who showed us this idea at convention, I think I might have given her a reason to like this punch. Simply punch the strip of cardstock like usual. Then go back through with the 3/4 inch circle punch and punch out the center. 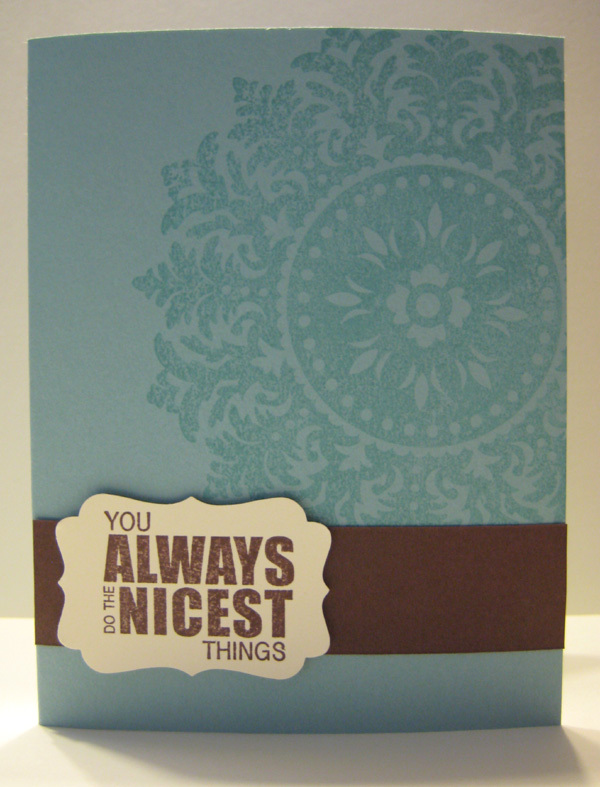 On this card I replaced the center with a center from another colored strip of cardstock. Makes for a very different look with the same punch. I am still playing around with this new Domestic Goddess Designer Series Paper and Now You're Cookin' stamp. Here's a quick way to give a recipe to a friend with the card and recipe all in one. It folds in from both sides like a Joy Fold card so it isn't flat here, but you get the idea. I am getting ready to put in another order for ribbon. If you want in on this round of the ribbon share, drop me an email. Details can be found in this post. Time flies when you are having fun. I spent most of convention thinking this was my 4th, but on the way home my friend Shirley and I were counting up and realized it was the 5th! I did however know I had been a demonstrator for 5 years, and I was one of 8 women in our group walking across the stage for the 5 year milestone walk! 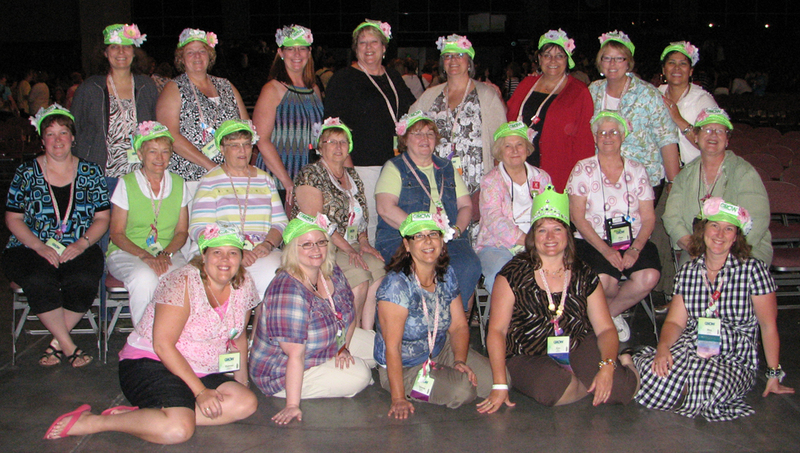 Our group wears green hats so we can find each other easily in a crowd of more than 3,000 people. Here we are minus a few ladies that had to leave early. I am on the left end of the center row. We are so proud of our uplines Kim and Meg who are in the top 100 demonstrators again this year! It was truly one of my favorite conventions. We got a sneak peek at products and samples from the Holiday Mini Catalog, and let me just say - start saving your pennies now. It's pretty great. 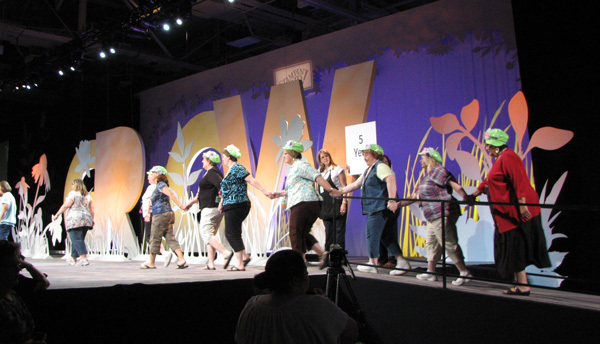 All of these green hat ladies were a big part of the fun I had, but the classes, demos, displays, shopping at Momento Mall all add up to a great experience and lots of new ideas to share. 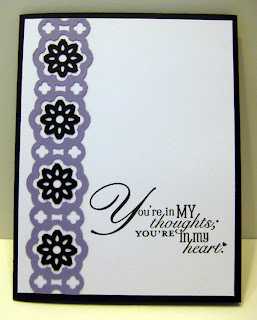 Here is my version of a card created by Carrie Cudney from Stampin' Up! I did it with my stamp club ladies tonight. It uses the new Lace Ribbon Border punch for a cute little cake stand. And if you can't tell, the cake is made out of Hershey Miniatures wrapped in Just Add Cake Designer Series Paper. If convention sounds like something you would like to be a part of next year, this is a great time to sign up to be a demonstrator. The starter kit is $99 and you get a Christmas Keepsake Box on top of that! I saw a fellow demonstrator make one of these at a meeting I attended recently and thought they would be perfect gifts for my convention roommates - thanks Cindy for the great idea! They hold a little Bath & Body Works hand sanitizer and gave me an excuse to open up another new package of Designer Series Paper. 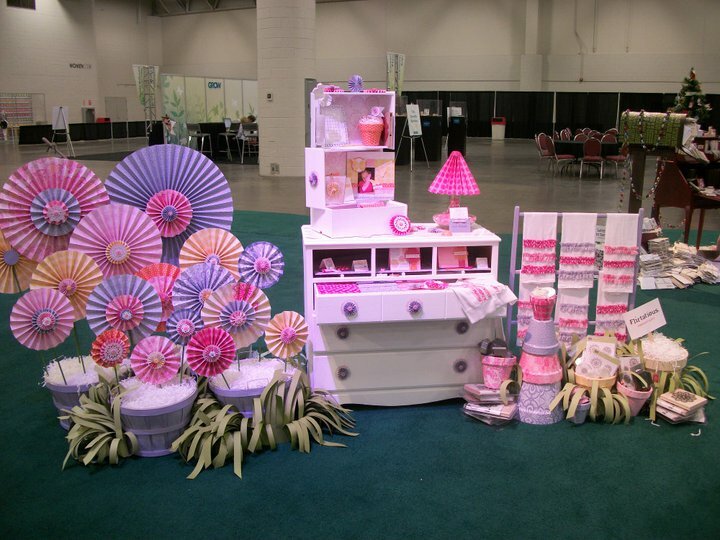 This is Berry Blossoms and the handle is made with a new 3/8" ruffled ribbon. 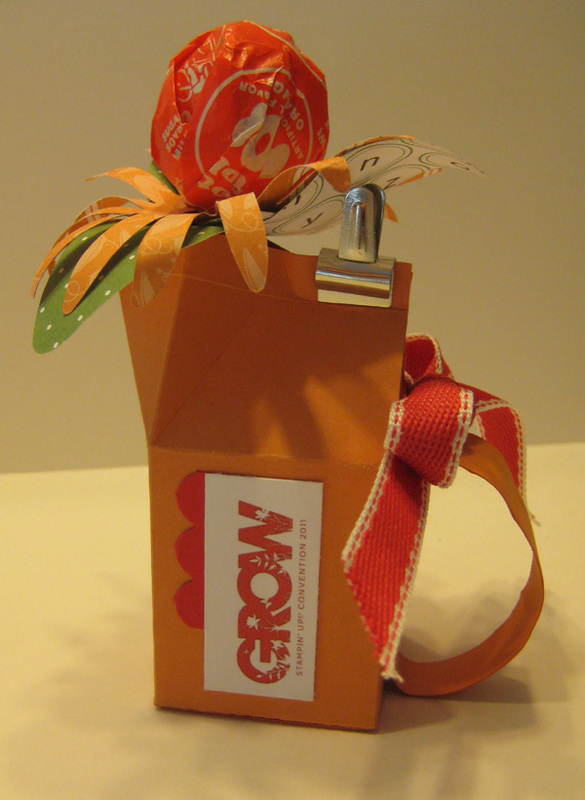 See this post if you are interested in getting this ribbon and others in smaller quantities through a ribbon share. 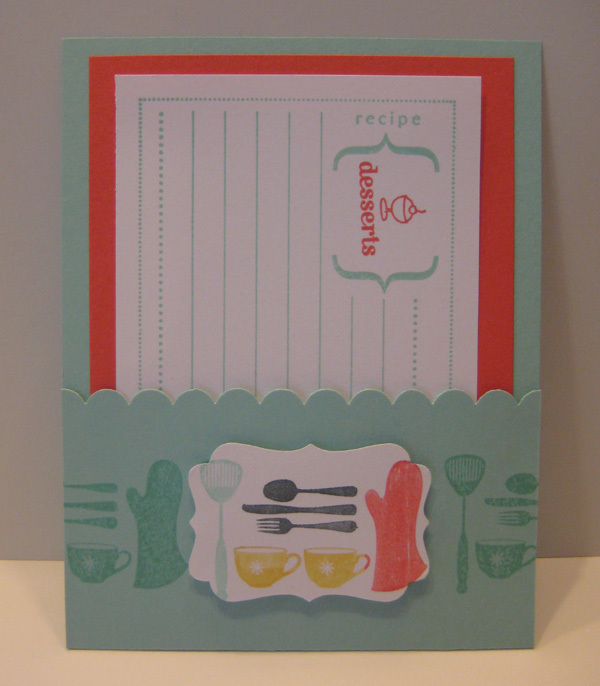 Here is another one of my swaps using one of my many new favorite Designer Series Papers - Domestic Goddess. I just love that tablecloth paper! 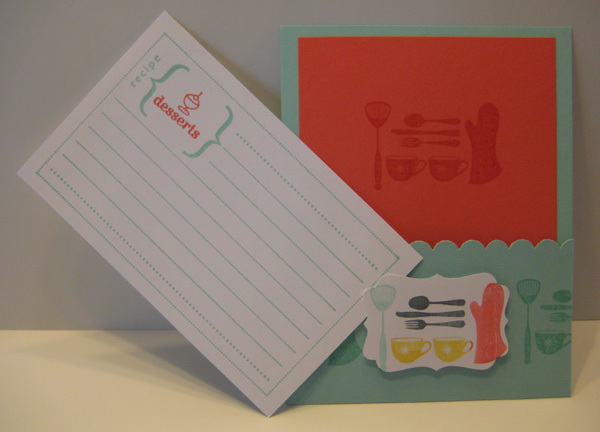 It also uses a new stamp from the set Creatively Yours and Now You're Cookin'. I guess this one needs a treat with it when I give it away. I am taking a few of the Wisteria Wonder version to convention with me for swapping since it has all of the new In Colors on it and features a new birthday greeting from the new hostess set Happiest Birthday Wishes. 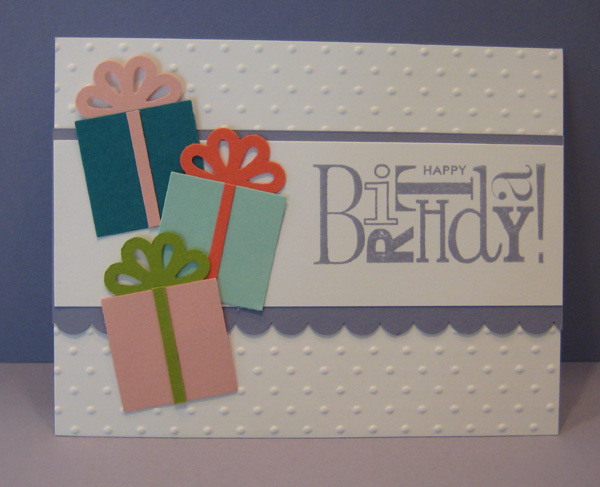 Isn't this another great way to use the Blossom Bouquet Triple Layer Punch? When planning for my convention swaps, I strategically looked through my new Idea Book & Catalog trying to formulate an idea. I knew I wouldn't have a lot of time between my order arriving and convention to get the swaps made. 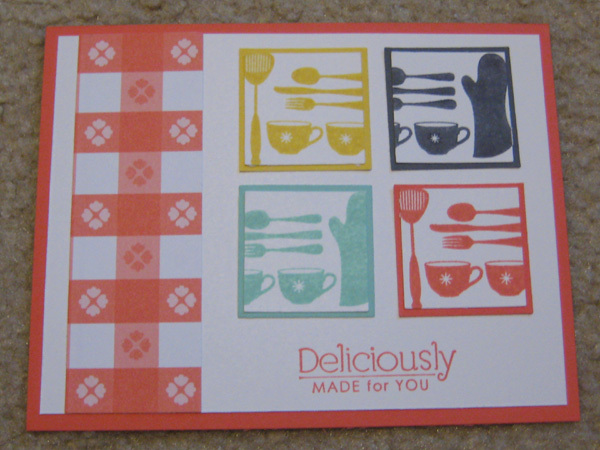 I was drawn to the Domestic Goddess Product Suite on pages 52 and 53 of the catalog so I thought I would combine the Now You're Cookin' stamp with the From the Kitchen Of stamp set that I already had. So I ordered that stamp and 2 packages of the Domestic Goddess Designer Series paper so I would be ready when my order came. The ironic thing is that once I started working I totally redesigned my swap card. 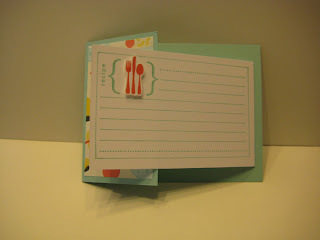 You'll see that in a post soon using the Now You're Cookin' stamp and the Designer Series Paper. But here is my original creation. 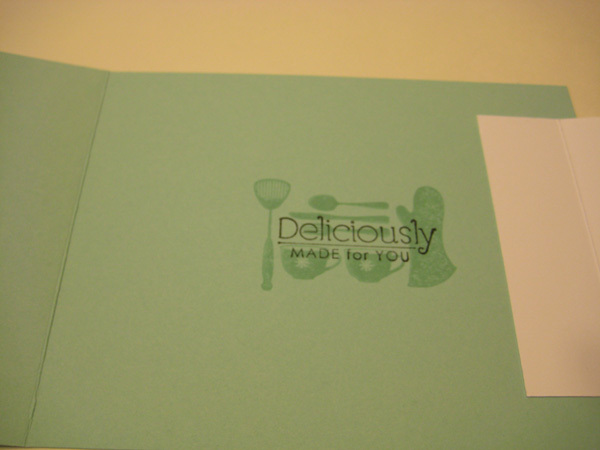 Although these are not the first colors you think of when you think cooking and recipe cards, I think that is why I am drawn to those pages in the catalog... 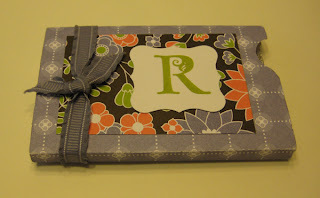 I love the way Stampin' Up! combined these colors. We made this card at my last stamp-a-stack. The theme was cards for kids, but I think this could go to anyone young at heart. My first thought was birthday but after thinking about it, this would make a great get well card for a kid too. 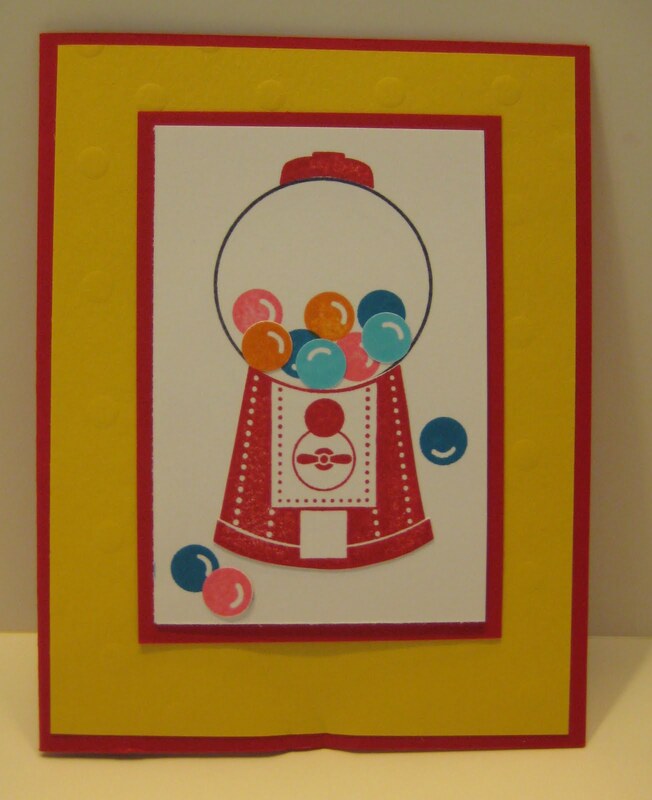 We stamped some of the gumballs on the background and then punched a few to give it a more realistic layered look. 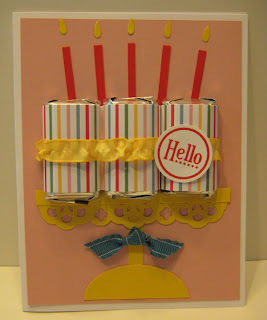 This set, Sweet Centers, coordinates with the treat cups so you could do a more 3-D card like this one. 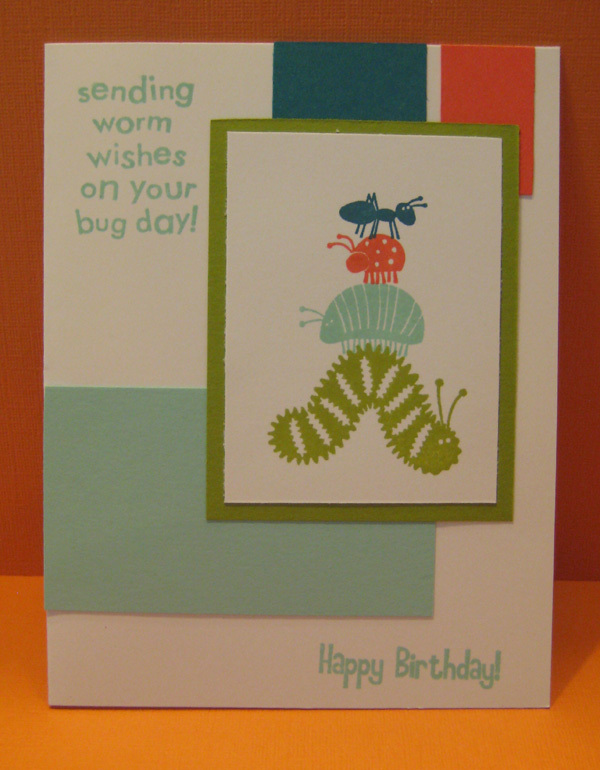 I had to do one last card with the now retired Cute as a Bug stamp set at my July 1 stamp-a-stack since the theme was cards for kids. It was fun to work with all but one of the new In Colors on the card, but somehow Wisteria Wonder just didn't fit with the bug theme. Those of you that read my newsletter know that June's contest was to guess what stamp set I will miss most. And though you only have to enter a guess to possibly be drawn as the winner, if you had guessed Cute as a Bug, it was right up there on my list. This month's contest is just as easy and you could win a free stamp set. If you would like to receive my newsletter, sign up in the right sidebar. A new one just went out today! There are some great new ribbons in the new catalog and I have two different ribbon shares for you to consider. It's a great way to get a little of each without having to buy all of them at once. 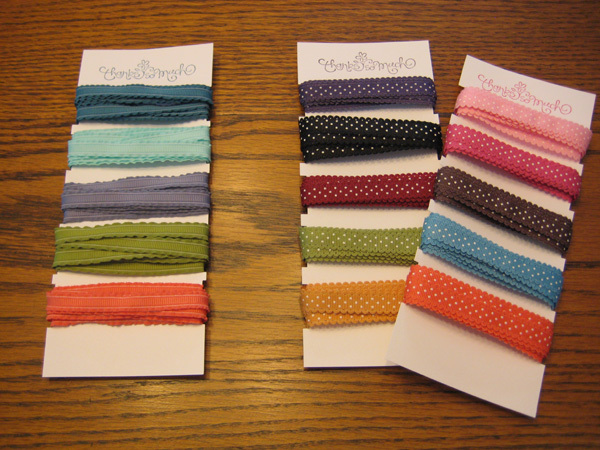 The first ribbon share is for the 3/8" ruffled ribbon in the new In Colors. You will get 2 yards of each of the 5 colors for $12. The second ribbon share is for the 1/2" scallop dots ribbon. This is a new style ribbon with 10 of our favorite colors. You will get 2 yards each of 10 different colors for $20. Do both ribbon shares for $30! If shipping please add $2. Feel free to contact me if you are interested or for more details. 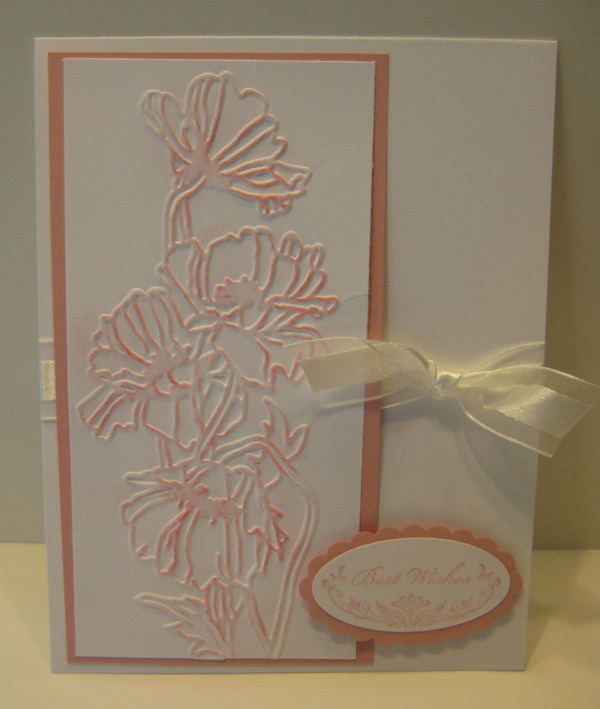 Here's a quick card made with the Flower Garden Embossing folder. There are a lot of options and different ways to color this image if you choose or you could leave it white and use it for background. At stamp club, I showed the ladies some of the different ways I colored this image including a brayer on either side, Stampin' Pastels, and a sponge dauber which is what you see here. 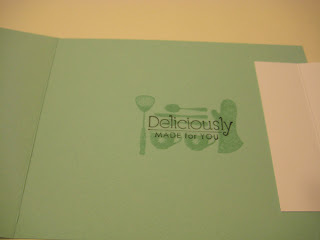 There are so many ways to use this embossing folder. Join my Stampin' Up! team in July for just $99! 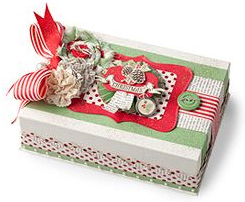 The kit contains new stamps, papers and ribbon, and as an added bonus, get this Christmas Keepsake Project Box ($40 value) too! What a great way to get some of the new InColors! Visit my Stampin' Up! web page to sign up now or feel free to contact me with any questions. 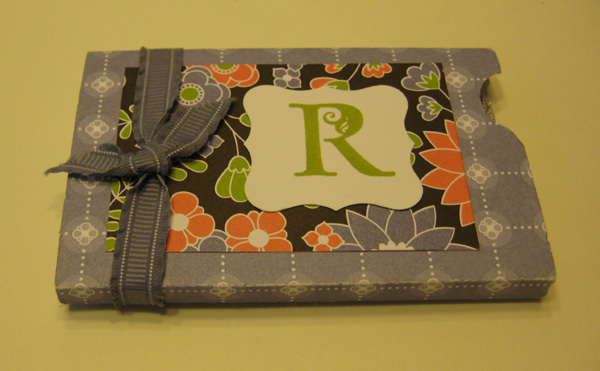 One of the many benefits of being a Stampin' Up! 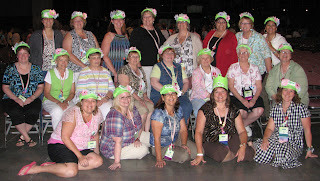 demonstrator is our monthly Stampin' Sucess magazine. It is full of articles, previews and ideas. 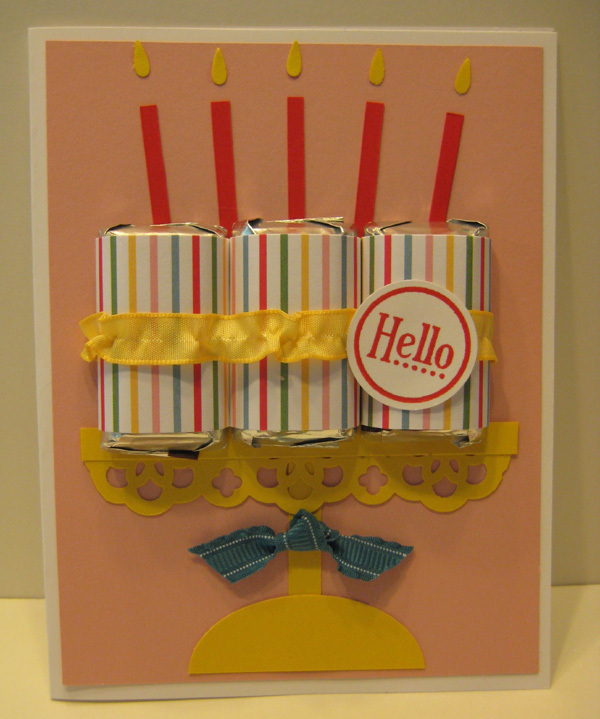 Here is a card I recently made using the magazine as my inspiration. Be watching my newsletter next week and my blog for information on a ribbon share with some of the great new ribbons!